1. Heat oven to 325 degrees F. Line baking sheet with foil. Reserve 3 tablespoons sliced almonds for mouse ears, and place remaining almonds in food processor; pulse until finely ground. Add sugar and egg white, and pulse to combine. Melt 1/4 cup chocolate chips, add to mixture, and pulse. Shape tablespoonfuls of dough into teardrop shapes; place on baking sheet 1 inch apart. Bake 25 minutes. 2. 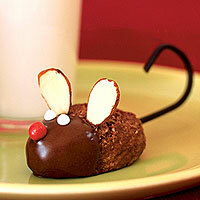 While cookies are still warm, insert 2 almond slices for ears and 1 piece of licorice lace for tail. Let cool completely. 3. Melt remaining chocolate chips. Dip front of face in melted chocolate, and attach a cinnamon candy for nose. Using icing, pipe 2 eyes. Let set 10 minutes.